The late Steve Jobs was said to possess a “reality distortion field,” a charisma that got people to jump through walls for him, and drew capital to him, even when results weren’t going his way. But who has the biggest reality distortion field today? It’s clear that many tech companies don’t have one. Microsoft doesn’t have one. Intel doesn’t have one. Hewlett-Packard and Dell don’t have them. But some companies do, and here we’ll discuss why, with some hints as to what you can do to profit from them. The oldest reality distortion field in technology belongs to Oracle Corporation (NASDAQ:ORCL) and its living Guy Fawkes mask, CEO Larry Ellison. Oracle has successfully used its dominance of database technology in ways Microsoft could only dream of. Revenues are up four-fold since 2003, from $9.48 billion to $37.12 billion. Profits have risen in line with that, from $2.31 billion in 2003 to $9.98 billion in its most recent fiscal year, which ended last May. All this has given Ellison enormous street credibility, which he’s used to buy out competitors, raise prices on customers, and continue on his proprietary path. Ellison’s biggest risk was the purchase of Sun Microsystems, announced in 2009. remains his biggest bet. 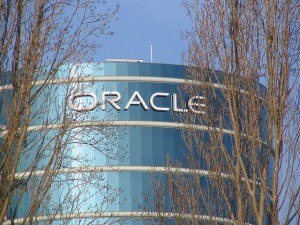 It made Oracle Corporation (NASDAQ:ORCL) a hardware company, and that has been a drag on results since. It made Oracle the largest sponsor of open source in the world, and Oracle antagonized that community in response. Yet since then net income has grown even faster, 62%, than revenue, 41%. All this has created a substantial reality distortion field that obscures the fact that Oracle is missing the biggest technology turn of the decade, cloud computing. The “Oracle Cloud” consists of high-priced Sun servers and proprietary Oracle Corporation (NASDAQ:ORCL) software, not the commodity products which deliver savings people are looking for. Say that, however, and get ready to be flamed. I’d say that’s a substantial distortion field you have there. It protects Oracle’s stock price, up almost 16% over the last year, but that price is starting to meet resistance, especially after what most consider a disappointing earnings report for February, with flat revenue and lower net income. Investors are paying 15.34 times those earnings for Oracle Corporation (NASDAQ:ORCL) shares, but if the company fails to deliver in the current quarter, ending next month, the curtain will have been pulled behind the wizard, and the fall could be harsh. Since becoming CEO of Google Inc (NASDAQ:GOOG) in April 2011, co-founder Larry Page has presided over the growth of both a company and a legend that rivals Jobs’ own legend. Over the period sales are up 40%, net income about 20%, but few seem concerned about that deceleration. They blame the acquisition of Motorola last year, which was considered necessary in order to acquire patents to key mobile technologies, protecting its Android mobile operating system. But those patents have proven ineffective in court. Motorola has indeed had its negative effect on margins, but it hasn’t helped Google Inc (NASDAQ:GOOG) prevent a further fracturing of the ecosystem. Amazon’s Kindle might as well not be an Android at all. Samsung, the key OEM, is experimenting with its own new OS, Tizen. The Chromebooks that seemed to be a coup are turning into an anchor around the company. Google’s strategy advantage remains in place. Its cloud is the most cost-effective way of doing anything on the Internet, because it uses commodity servers, recycles energy, and owns its own fiber. But other companies now know the recipe, and are eating into that strategic advantage. Right now, investors are willing to pay 24 times the last 12 months’ earnings for Google stock. They are expecting exceptional acceleration on both the top and bottom lines. Google is preparing to run out its biggest risk yet in Google Glass, which has long been pushed by co-founder Sergey Brin. My view is that this is a game Google Inc (NASDAQ:GOOG) will lose, and perhaps deliberately, because losing would discredit Brin and leave Page alone at the top. If you own Google shares during this next year you are in for a bumpy ride, because the promised acceleration in results just isn’t coming for you.